For the first time, the final talks of a Beam Reach program are available for viewing on-line as videos (hosted by Vimeo). Links to the videos, as well as the final PowerPoint presentations and papers can be accessed through the spring 2009 class page. Does an increase of boats cause lower call rates? Over the last ten weeks we have learned a tremendous amount. We learned how to: ask a question, design a research project to possibly answer this question, write a proposal, conduct research, sail, live on a boat with seven other people, analyze data, run statistics on our data, and write a final paper on our findings. Another very important lesson we learned was how to give a presentation. Knowing how to conduct research and write up a paper on it is a pretty important part of science. If you can’t explain your findings to the general public then you can’t share your knowledge with others and no one else can use your findings to ask more questions. 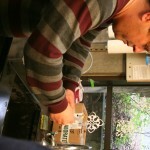 On Wednesday, we presented our research to the other students at Friday Harbor Labs as well as other community members. I think this lesson was a great one because it is really important for others to understand what you did and what you learned from your research. Public speaking is a skill that every scientist should develop and presenting our findings on Wednesday was the perfect practice. Developing skills using powerpoint is also a good tool to have. Somehow while we were on the Gato Verde it got out that I had never seen Star Wars. When this news hit, Jaws dropped, “OMG!”‘s were screamed, and comparisons to locking children in closets for several years were drawn. Actually that last reaction was only one comparison, made by Jason, who then showed up the next morning with all three original Star Wars movies. We ravaged through them over the next few nights, and I realized how glad I am that I didn’t see them as a kid. I’m sure the level of obsession I would’ve most likely reached as an 8-year-old would have been hard to recover from. The movies are amazing! The distinction of the dark side being a place of fear and hate instead of just sheer evil is so brilliant! Now on a regular basis I find myself thinking things like, “Calm down Hannah, it’s only a robot, don’t give into your hate and the dark side…” Then I crack up, and I am able to resist. This is just one more example of a well-rounded educational experience, brought to you by Beam Reach. As Peter has explained in an earlier blog, we chose to do our sustainability project on surfactants. So after learning what surfactants actually are and how common they are we decided to go for it. We realized that this would be difficult to measure and find an effect. We started out just wanting to calculate our output of greywater into the ocean. Since we don’t shower on the boat the main greywater output is from washing dishes. So how do you collect greywater? Well since we were on a catamaran and the drain from our sink is between the two hulls above water that should be easy to collect right? I thought so when I volunteered to take the dinghy under the boat and collect the grey water from dishes one night after dinner. I quickly learned this was more difficult than I anticipated. First I tied a rope to the stern of the boat and had the other end of it in the dinghy with me. 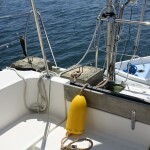 Then I tied the bow line of the dinghy to the bow of the boat so that I could pull myself back and forth under the boat and make it easier to position myself for the water collection. Once I was under the boat I realized that the space between the water and the boat is not as big as it looks. Once I was under the boat I managed to get the dinghy to a spot where the bucket was under the drain. I quickly learned that the water didn’t run out of the drain in a nice stream. It splattered and ran along the bottom of the boat for a few centimeters before falling. So I had to hold the bucket under the drain with one hand and hold the dinghy in place with the other. When the dishes were done the bucket had 4 gallons of water (~12 liters). We then collected and filtered about 4 milliliters to take into Russel Barsh’s lab to test the concentration. We found that the concentration of our grey water was 55 parts per million (ppm). So grey water is extremely concentrated. After washing dishes from one night we produced 4 gallons of greywater with a concentration of 55 ppm! Then we started thinking, we know what we are putting into the water, but we don’t know what is already there. So we decided to take samples from some of the different Harbors we stay at overnight. After running a test sample using water from Friday Harbor we quickly realized that areas with good circulation will not have high concentrations even if they have higher inputs because it is mixed better. Our focus soon became harbors that have poor circulation but still have a lot of boats inhabiting them throughout the summer. The more people and the more boats in the harbors, the more surfactants are put into the water. 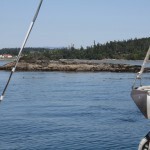 The harbors we sampled were Mitchell Bay, Reid Harbor, Prevost Harbor, and Roche Harbor. Friday Harbor was also tested but there was no detectable amount of surfactants in the water. We are currently still waiting for the results. This information will be very useful as far as management goes. It is possible that some of these popular Harbors with poor circulation might need to have maximum amount of boats allowed in the Harbor at any given time to keep the concentrations from building up too much. Results to be posted soon! Our time aboard the Gato Verde has come to a close. I miss sleeping in my narrow forward berth and being surrounded by water all day everyday. I must admit though that it is nice to be able to walk and move as I please, instead of being confined to a 42 by 26 foot square. I have always wondered if I would like to spend day after day on a sailboat in the big open ocean. These last three weeks have confirmed my reliance on movement and open space, and I now know that long periods of time in small spaces is not for me. However, I did thoroughly enjoy the act of sailing and hope to continue building on what I have learned here in the future…just as long as I can swim or run in the same day. Beam Reach and the Gato Verde had an excellent opportunity this term during the Beam Reach program. A film crew and a producer of the Show “Orca: The Sea Wolf” came aboard the Gato Verde to do some filming of the program and mainly Orcas and communication. 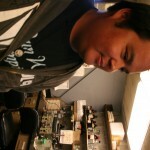 Alexis, a producer from Pangolin Pictures, came aboard on May 27, 2009 around nine at night. She gave us release forms to sign and then she went to bed after a long day. Then in the morning Jeff, the cameraman, and his wife Kim came aboard. 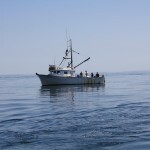 They started to film us releasing the boat, heading out, and our normal routine with getting updates on the whales. I got to make a phone call to Mark Mallison, a contact in Victoria, and have the entire conversation filmed. Then once we were out, Erica and Matt did some hydrophone deployment, got many shots of the Gato Verde, and us searching for the whales. It was a pretty cool day, and we all can’t wait until we get updates on the show and when it is going to air! We are going to be in a small portion on the Discovery Channel! That is so cool and we are super excited! It was a great experience to have because we got experience the world of entertainment of a bit and got a peak into what our futures are going to be like we ever get filmed again. Plus it was excellent advertisement for Scott, Beam Reach, and the Gato Verde! That is always a good thing! A new learning experience was gained with this experience and along with the many more from this program. Surfactants are used in our everyday life, whether we are washing our hands to our hair, cleaning dishes, or cleaning clothes. Surfactants play an important role in our everyday life as humans. Surfactants work by having a hydrophilic head, which loves water and a hydrophobic tail, which hates water. What makes it so useful is the fact that the hydrophobic tail will leech onto all the oil and grease we on household items and on ourselves. Then when each of the tails form a core that encloses an oil droplet, this is called a micelle. This makes both of each end of a surfactant happy. What is useful to humans is causing harm to fish and other inner tidal organism. Erica and I, as Beam Reach students in the spring 2009 term, have decided to measure the surfactants that the program releases into the ocean, while on the Gato Verde. With the help of Dr. Russel Barsh we have created a process of measuring each of the samples we have collected on the Gato Verde. 1. Must be 48 hours before we run the test, if it sits to long the sample turns bad. 1. 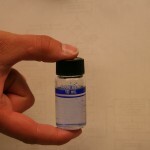 Dilute the sample: 1mL of sample to 99mL of nano pure water. 4. Add sodium chloride (salt) to bring up the density of the water. tidal organisms. Some of the effects are disrupting gas exchange across the gill, which clogs up oxygen exchange, and it suffocates the fish. It can also clog pours and disrupt membranes in crustacean causing the membrane to burst. If surfactants are doing damage to fish, how can that affect the SRKW? Our best option right now is to use less, but still find a efficient way to be clean! Remember the saying less is more. PS: Thank You Dr. Russel Barsh for helping us in the lab and informing us about surfactants and its effects! Being in new places means meeting new people. Last weekend Hannah and I met some very interesting people who are members of Sea Shepherd. I had never heard of this group before we met them and it has been interesting reading about their history and some of the things they have done. This organization was established in 1977 as an international nonprofit marine wildlife conservation organization. Their mission is to end destruction of habitat and slaughter of wildlife in the world’s oceans. They have a very innovative direct action methodology in order to put a stop to killing of endangered marine species and ecosystems. They actually confront the offenders on high seas and have been known to sabotage ships and equipment. They have also been known to throw stink bombs onto the ships and in the past even ram into ships in order to disable them. The three main industries that Sea Shepherd targets are: the illegal whaling or killing of dolphins, the slaughtering of seals and the shark finning operations. Crewmembers are all volunteers and pay their own way to get to the ship for each mission but food and the stay on the boat is free. This organization has made many enemies and has been called eco terrorists by some governments. At the same time there have been many governments who have actually asked for their help with protecting patrol boats at times. They have raised a lot of awareness to issues that were not well known to the general public. They have also made a lot of political progress in stopping sealing in some European countries. The controversy lies in their sometimes violent methods. We have had some conversations about the organization, their methods, and their goals. Everyone has a different way of looking at it but we do all agree that they have done some good things and some not so good things. In the last year Animal Planet did a 7 show series titled Whale Wars. This show spread the word to the general public that whaling still occurs today and is not just a thing of the past. Although their sometimes violent methods are frowned upon they have made the public more aware of many issues in our marine ecosystems that need to be addressed. We woke to a rainy, gray morning in Prevost Harbor. We desperately needed to pump out so we went to Roche Harbor first thing and held our morning meeting on the way. We spent the morning discussing Hannah’s journal club article and headed to the Lime Kiln area, hoping to catch the whales while we satisfied our other science goals. We were finally able to record some ship data for my project but we were eventually driven north towards Mitchell Bay and shelter by bad conditions. Before entering Mitchell Bay, we took a conductivity, salinity and temperature cast and also practiced vertical plankton tows. We took a quick reading of the water clarity using a Secci desk and then proceeded into Mitchell Bay at about 6:15. Scott and Jason made amazing minestrone soup, cornbread and salad for dinner and we settled in for a quiet evening, fending off the wet and cold.